Berkeley alumnus, businessman and philanthropist Barclay Simpson has been awarded the Berkeley Medal, the university’s top honor. 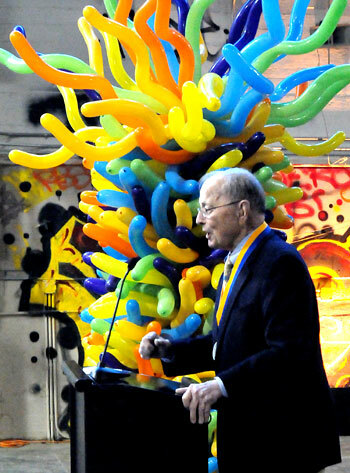 Simpson received the medal from Chancellor Robert Birgeneau in a small ceremony at the future site of the Berkeley Art Museum and Pacific Film Archive in Berkeley’s downtown arts district shortly before the winter break. BAM/PFA director Lawrence Rinder presented Simpson with a unique memento, a brick recovered from the building site and imprinted in appreciation for Simpson’s leadership in the new building project. Birgeneau commended Simpson for his support of the BAM/PFA building campaign as well as Cal Athletics, scholarships for Berkeley students, and for campus-community programs including the Young Musicians Program, the Young Entrepreneurs at Haas and the Ailey Camp held every summer by Cal Performances. Simpson, the founder of Pleasanton-based Simpson Manufacturing, is a member of the BAM/PFA board of directors and has served as its president and chair. He is an ardent advocate for the arts on campus and elsewhere. He and his wife, Sharon, owned a fine-arts gallery in Lafayette,. Simpson has been a major force in the initiative to replace BAM/PFA’s seismically challenged museum building on Bancroft Way, and was the focus of a special tribute at the museum last May. “In everything he does, Barc has a positive effect on the lives around him,” the chancellor said in presenting Simpson with the Berkeley Medal. The award goes to individuals whose work or contributions to society illustrate Berkeley ideals and contribute to the university’s goals, and whose careers have benefited the public in exceptional ways. Simpson said he was totally surprised by the award because he had never heard of it, and because it came at an event for BAM/PFA. “Later I found out how important this medal was,” Simpson said by phone this week. “I actually felt a little guilty. I really didn’t think that I deserved it.” But after learning how special the Berkeley Medal is, “it was really exciting,” he added. In the community, Simpson has supported Girls Inc. in Oakland and has served on the board of the Bay Area Rapid Transit district. While a Berkeley student during World War II, Simpson signed up as a U.S. Naval Air Corps pilot and deployed with his fellow “Flying Golden Bears” to the Pacific following the bombing of Pearl Harbor. After an extended break from Berkeley, Simpson returned and earned a B.S. degree in 1966.